The Golden-backed Bishop was formally named by Johann Friedrich Gmelin, a German naturalist. Gmelin described many new bird species in a book in 1789 in the style of Linnaeus' publications, giving a brief description in Latin and a synonomy, including a reference to Peter Brown, an English naturalist and illustrator. Gmelin noted the locality for the Golden-backed Bishop as Benguelo. Peter Brown was the first to write about, and illustrate, the Golden-backed Bishop. 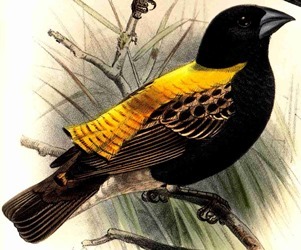 He called it the Golden backed Finch and gave a description of the bird. Brown notes that the bird was in the collection of Marmaduke Tunstall, an English ornithologist and collector. The bishop would have been brought by ship from coastal Angola to England, where it would have been purchased by Tunstall. Tunstall kept a pair, and possibly more birds, in captivity for several years - one bird survived for at least 8 years (Fox 1827). Loxia aurea	Gmelin 1789 Syst. Nat., 1(2), p.846	Benguela (ex Brown, 1776, Nouv. Illustr. Zool., pl. 25), s Angola. The Golden backed Finch (Brown 1776). Before 1776, when a description was first published. Type specimen no longer exists; the illustration of Brown 1776 serves as a type. Identification. 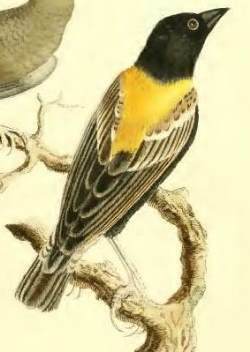 The Golden-backed Bishop Euplectes aureus breeding male differs from the Yellow-crowned Bishop by a black head, from the Yellow Bishop by wholly golden orange upperparts, white wing edgings (no yellow shoulder), and a shorter tail. The female and nonbreeding male Golden-backed Bishop are distinctive with a rufous-brown breast and flanks, and the upperparts have black feathers edged rufous-brown or orange-buff. Distribution. 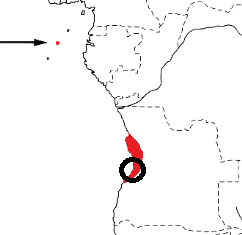 The Golden-backed Bishop is restricted to a small area of coastal Angola, and Sao Tome Island (see map below, based on Birds of Africa). There are no subspecies of the Golden-backed Bishop. 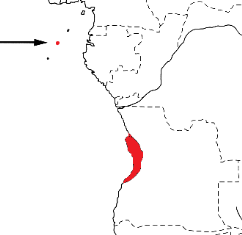 The two isolated populations suggest that this species may have been introduced from Sao Tome to Angola, or vice versa. Habitat. The Golden-backed Bishop inhabits floodplains and rank vegetation in open acacia savanna and abandoned cotton fields, overgrown gardens with bushy cover, and tall razor-grass. In Angola it is restricted to drier lowlands below the escarpment zone. Food. The Golden-backed Bishop feeds on grass seeds and insects. It is generally found in small flocks, and often in mixed-species flocks. Breeding. The Golden-backed Bishop is polygynous. It is not colonial, but nests are clumped in groups of up to 10. The male defends his territory by singing from 3 to 4 song posts, but may also sing in flight over his territory. During courtship, the male fluffs out the long plumes of the back. 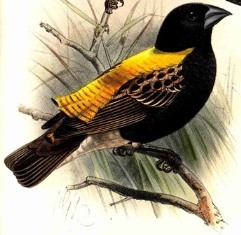 The Golden-backed Bishop often nests alongside Black-winged Bishops, and males of the 2 species may share song posts.